Before I get too far into the review I wanted to say that after seeing the final film in the "quadrilogy," I can now say with confidence that four films were truly unnecessary. 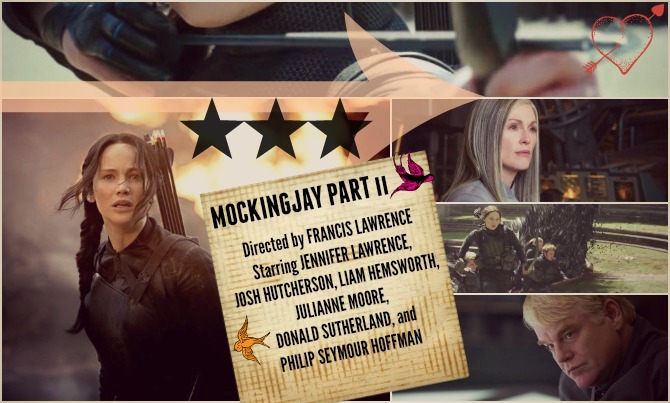 The third film was completely pointless and there were even a few fatty scenes in 'Mockingjay II' that could have been cut or trimmed. That said, the best part about this film (and about the book it's based on) is that is action-oriented. It gets down to business very quickly. If you haven't seen any of the previous films or read the books, then this review will be hard to follow. The film picks up almost immediately where 'Mockingjay I' left off. Katniss Everdeen (Jennifer Lawrence) has just been brutally attacked by Peeta Malark (Josh Hutcherson). She recovers only to find that Peeta is still brainwashed to kill her. 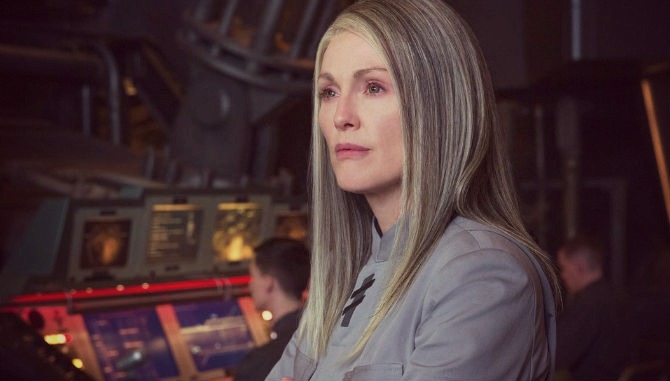 Under President Coin's (Julianne Moore) orders and Plutarch Heavensbee's watchful eye-- Katniss, Gale (Liam Hemsworth), and her PR team get back in the fight. I should note that Heavensbee's role has been greatly diminished because of the passing of one of the most brilliant and gifted actors of this generation, Philip Seymour Hoffman. 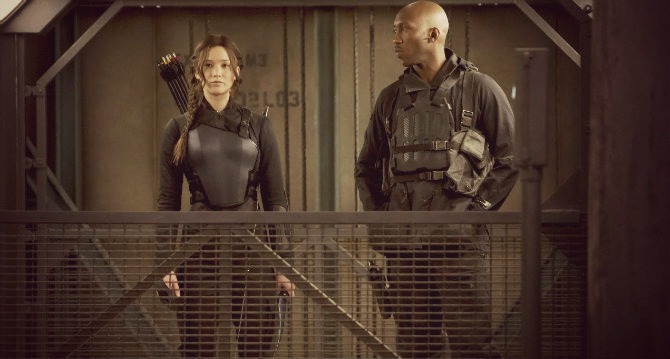 Katniss and the team visit District 2, which is an active war zone. Katniss' PR team film the mockingjay doing heroic things and making great speeches, all of which is supposed to keep the 13 districts focused on defeating the Capitol. District 2 houses the Capitol's most battle hardened warriors, who have hidden themselves away in a seemingly impenetrable mountain, which Gale accurately describes as a "wolf-den." It's here that we start to see the toll the war has taken on Gale's psyche as he recommends bringing the mountain down on the wolves and civilians alike, instead of going in. This is a foreshadowing of more to come. Commander Lyme (Gwendoline Christie of 'Game of Thrones') agrees, as it will inevitably spare the rebels from a frontal assault. Katniss is concerned about the fleeing civilians who may get caught in the crossfire. This film really touched (albeit in a PG-13 version) on the horrors of war and the innocent people who inevitably get caught in the middle. Had the filmmakers properly utilized the last film, this scene could have been really wonderful. Admittedly, the book glosses over it as well. The third book was not my favorite. It jumps around a lot and leaves loose ends. Katniss convinces the war brigade to leave a tunnel open to evacuate the civilians in the mountain, which everyone reluctantly agrees to. 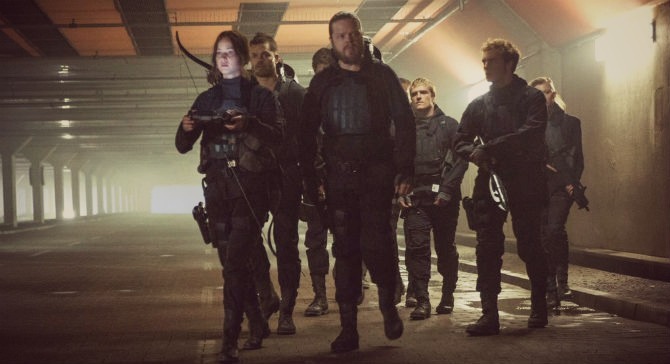 Katniss' hero-complex is put the test when one of the soldiers fleeing through the tunnel (the rebels mercifully left open) attempts to kill her. I'm not a Jlaw fan, but Lawrence does some good work here. This may be the first (and only) time I give her a compliment. 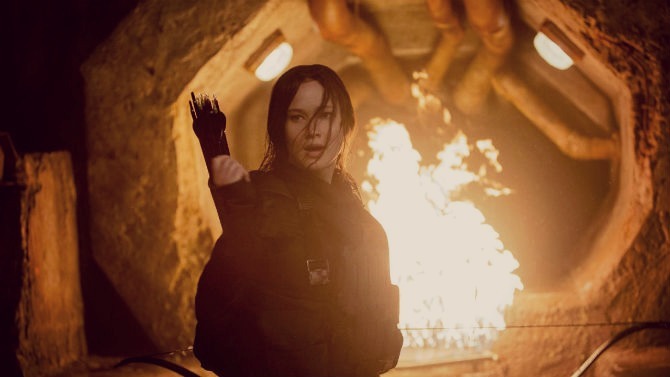 She manages to bring both a since of bravado and empathy to the role and after four films she's got Katniss down pat. I finally warmed up to Lawrence as Katniss after this film. I have always believed Lawrence was miscast in this series. Katniss was of Native American heritage in the books, diminutive, and small in stature. Think about it-- these people were on the brink of starvation. I hardly think a nearly 6-foot tall blonde glamazon was who Suzanne Collins pictured when she was writing her novels. Anyhoo, Francis Lawrence's direction is decent. I would NOT say "great," but it's good. He does a competent job of accurately capturing the spirit of the books. What's so surprising is that the original modestly budgeted 2012 film by Gary Ross (director of 'Seabiscuit' and 'Pleasantville') was the best film to date. Proving once and for all that more money does not necessarily make a better movie. But 'Mockingjay 2' is still a solid film. It does a good job bring all of the moving parts together and creating a satisfying conclusion. I also liked the fact that the scriptwriters lowered the volume on the whole "love triangle" thing. There's one scene where Jena Malone's character (Johanna Mason) made fun of Katniss' love affairs. I can't recall if that little scene was in the book, but it added a bit of levity in a heavy film. WE KEEP EACH OTHER ALIVE. Donald Sutherland gives another excellent performance as President Snow. Again, I wish there would have been a few more scenes with him. We also don't see nearly enough of Haymitch (Woody Harrelson) and Effie (Elizabeth Banks). The filmmakers missed an opportunity by filling the last Mockingjay film with utter crap, which prevented this film from expanding upon some key scenes. 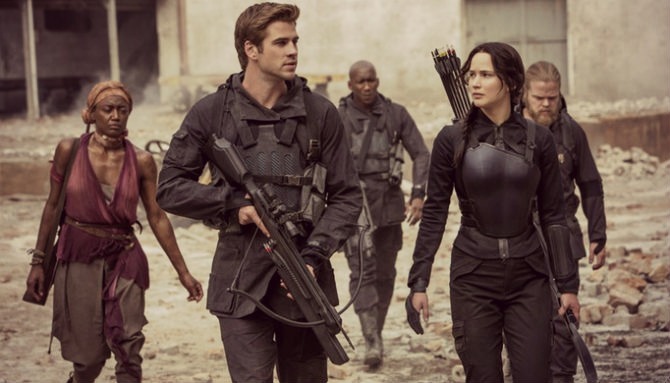 Needless to say Katniss and the remaining members of her team eventually make it to the Capitol. It's here that Katniss witnesses some terrible things. Again fleeing civilians caught in the middle of two warring armies is never a good thing. There was one missing scene from the books that the filmmakers should have added. In the books when Katniss comes across a civilian woman who was about to give away their location she killed her with no hesitation. She didn't want to, but she felt like she had to. It was clear in the books that Katniss' hands weren't always clean. This moral dilemma was missing from the film. AS YOUR HEART IS PURE. The film concludes exactly as it did in the books. Similarly it's not all cupcakes and roses when President Snow is finally deposed, as President Coin is equally nefarious. There are some very emotional sequences toward the end of the film that I actually shed a few tears over. Katniss ends up doing what Katniss does best! Overall, it's an ok film with a good cast. 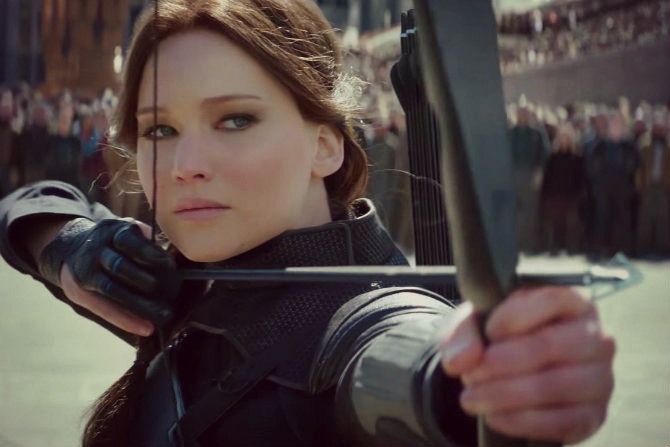 The character of Katniss is a fantastic fictional character to inspire young girls. She has loads more agency than Tris from the 'Divergent' series whose only motivation seems to get a boyfriend. There are some major flaws throughout the 'Mockingjay II' that should not be dismissed, but it's a fitting end to the quadrilogy. The film's biggest flaw was it's preceding film, which was not handled well at all. Interesting, thanks for the detailed review. I saw it much the same way you did. One movie too many but it ended strong. I was happy to have taken the journey despite all the quibbles that I to have with the adaptation. I think that's a good way to describe it! Yes, I enjoyed it despite the problems. Don't know wether I want to see this series or not! I think the first film is actually quite good. If you're going to watch them then its best to watch them concurrently. Great review! You liked it a bit more than I did, I think. I agree that the film should've been one movie, splitting it was a terrible idea. I was a little annoyed with some of the technical aspects of the film. It was so dark that things all kind of blended together. I also didn't like how they glossed over some of the big deaths. It just felt cheap. I agree. Some of the deaths did feel cheap. Especially the merry band who were with her. I didn't get that. There were so many things that were glossed over that (given the opportunity of the 3rd film) should have been covered in the previous film. The 3rd film was such a wasteful opportunity that this film is a relic of that. I'm one of the first to complain that a book adaptation movie has cut out all sorts from the book and it should have been longer, but this was just one step too far. It really didn't need to be split in two! I hope this isn't the way forward. Great review! Thank you! I totally agree. I have no idea why this was made into a 4 film franchise? I read the first book, but not the second and third. I saw the movie and did some research to see the biggest differences. The ending in the movie sounds like it makes more sense and has a bigger emotional impact. Not a huge difference like you said though. This movie could easily have been combined with the last one and it would have been better. It felt slow and plodding in parts. A good end to the series, but not great. I feel the same exact way Maurice! I hope you are doing well. I'm going to head over to your blog to see what you guys are up today! Good review, I just watched the first movie so lots of catching up for me. Hope all is well and you're ready for the season and the New Year! Happy Holidays Yolanda!! I am well and I hope all is well with you! Yes, I really enjoyed the first Hunger Games film. It's actually my favorite. Hi Sati! Thanks. I think this is more of a rental. Hoffman is in so few scenes. I think he passed away before (or right when) they started filming. I really wish we had more Hoffman. He would have been the best thing in the film.